Not all properties can be subdivided. The proposed new lots must all possess a combination of requirements for subdivision certification be granted. Subdivision is the process of dividing a large land allotment into two or more smaller land allotments, each on their own separate title. Each lot needs to be fully self sufficient, i.e. each will have its own connections for water, electricity, gas, phone etc. The service connections for one lot, such as water pipes, phone lines etc, should not encroach on another lot. A qualified land surveyor is the central consultant in any land subdivision. Is the subdivision process separate to the Town Planning Application and Town Planning Permit? Yes. Land / Property Subdivision requires a separate permit application to that of a town planning permit. Importantly, obtaining a town planning permit does not guarantee that you will be able to subdivide. Yes. Although it is possible to obtain a town planning permit to build two or more dwellings on a property, without subdivision, these dwellings will all remain on the one title. If you intend to sell the homes separately, then each home will need to be subdivided onto its own individual lot. At the end of the process, the titles office will issue a brand new certificate of title for each subdivided lot. Typically in Victoria the process should take around 3-4 months. However timeframes for individual projects will vary. Each lot is not fully self sufficient for all required services. The designer fails to clearly indicate connection points on plans, causing trades to “guess” where services should be connected in order to acheive a clean subdivision. The designer places connection points in locations which cause service connections for one lot to cross lot boundaries of another lot. The trades for each service install connection points at the wrong locations. All of these outcomes are costly in terms of delays and dollars. Service connections to new dwellings should be considered right from the initial site layout of the proposed development. It helps to consult with an experienced residential designer, a residential buiilder, an engineer and a licensed land surveyor before finalising your site layout. With the input of all these professionals, your chances of a clean and swift subdivision are greatly increased. Clearly identify all service connection points (Gas, water, electricity, sewerage, telephone, cable etc) and asset locations on plans. Ensure that all lots are fully self sufficient. Plan layout of units to ensure there are no service connections crossing neighbouring lot boundaries. Make sure that each service contractor knows where their service connection points and assets should be located. Subdivided lots can be sold as vacant, with plans and permits to build, or be built on and then sold as finished dwellings. For more detailed information on the requirements for Subdividing land in Victoria, refer to Clause 56 of the Victorian State Planning Policy. Property Subdivision, more specifically townhouse projects in suburban Melbourne are currently growing in number year on year. Many owners of older homes have a desire to upgrade their dwelling, but stay in the same location. A townhouse subdivision enables this. DSB can help you identify the subdivision potential of a site you are considering purchasing, or indeed a site you already own. Once a site passes the criteria for subdivision, the key is to design dwellings which feel like they are much larger homes than they really are. The essence of townhouse development is to pack maximum function and aesthetics into minimum space. DSB is an industry thought leader when it comes to the art of townhouse subdivision in Melbourne. For every project, our goal is to set new sales records for townhouse units in the given suburb we are working in, for every given client. The process of property subdivision is actually separate to the planning and building permit. The central consultant in a townhouse subdivision is the Land Surveyor. In essence, a new plan of subdivision is drawn up, and the titles office is engaged to approve the new titles for each new lot. In Melbourne, (and Victoria) the average time for this process is approximately 5 months. The most opportune time to carry out the property subdivision is normally during construction. Typically, once the concrete slabs have been poured for each lot, the land surveyor travels out to site to confirm the new boundaries for each townhouse/lot and draws up the new plan of subdivision for lodgement at the Victorian Titles Office. Across the established suburbs of greater Melbourne, local councils almost always require that a planning permit be in place before an application for property subdivision can be made. 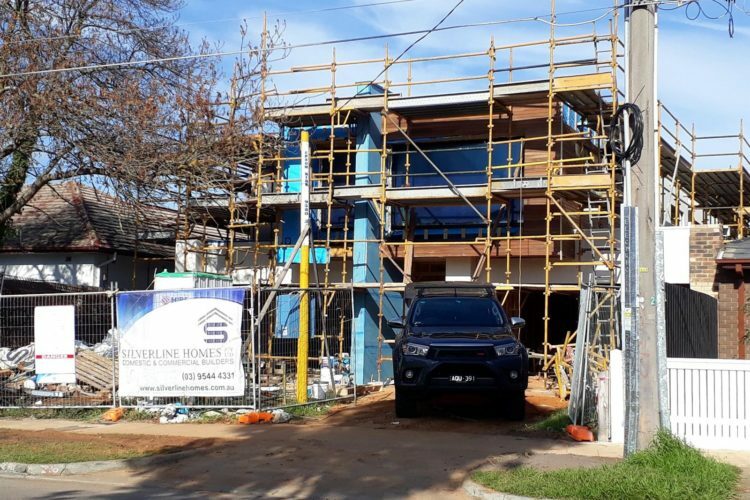 The reason for this is because councils want to know what the size and appearance of the intended townhouses will be, before granting permission to subdivide. Council’s aim is to avoid a clash of character between the new homes and the local character of the area. For “greenfield” subdivisions, which are out beyond the older more established suburbs, councils are more likely to approve property subdivision for new lots without the need to first have a planning permit describing the intended new dwellings. In terms of cost efficiency during the property subdivision process, it works out less expensive if the same land surveying company completes both the initial feature and levels survey and the subdivision process. Technically you do not, however if you do not, you run the risk of council changing the rules for minimum lot sizes in the future and being stuck with more than one house on a single lot, which will prove very difficult to sell. From a financial point of view, having your lot subdivided into individual titles for each townhouse will mean that the sum value of the units will be higher than if the multiple dwellings were left all on one title / lot. When borrowing from a bank to acquire your next property, the bank or lender will be likely to lend you more if each townhouse is on its own lot. If you wish to find out more about the process of property subdivision, please use the enquiry form to contact us. DSB’s role is to help educate townhouse developers and facilitate the services you require. DSB operates across all councils of greater Melbourne. The council of Bayside is quite “pro-development” and DSB has many projects at various stages of completion in this municipality. So if you are looking for a specialist firm, and require subdivision architects in Bayside council, DSB can help. Knowing the local planning policies and design guidelines are important, so if your site is in Kingston, then it is wise to select experienced subdivision architects in Kingston. Similarly, if your site is in Glen Eira, it is prudent to select an experienced subdivision architect in Glen Eira. Suburbs such as Parkdale are very popular for Dual OCC and duplex projects at the moment. As one of the most prevalent subdivision architects in Kingston, DSB has conducted dozens of projects in that particular council. Over the years, we have found that Glen Eira council are particularly supportive of side by side (duplex) development, so if you require an experienced subdivision architect in Glen Eira council then we can offer some helpful advice based on our experience of negotiating dozens of planning applications. When it comes to obtaining development finance, banks and lenders can sometimes ask for the plan of subdivision to be drawn up prior to the start of construction. If you require a plan of subdivision, then feel free to drop us an email or give us a call, we are here to help. The normal stage for carrying out the subdivision process is after the concrete slabs have been poured for the new dwellings. However, a different method does exist. IN some situations it makes sense for the developer to create “2 part contracts”. This is where the developer pays for the services connected for the new lots, and the subdivision is done before formal construction starts. The properties are sold off the plan, with one contract being with the developer, for the newly subdivided land, and the other contract is with the builder, for the dwelling which will be subsequently built on the land. If you would like more information on 2 part contracts or joint ventures then please contact us for a chat.